Three weeks ago, while at Perfect Living exhibition, we stopped by a booth promoting window dressing. 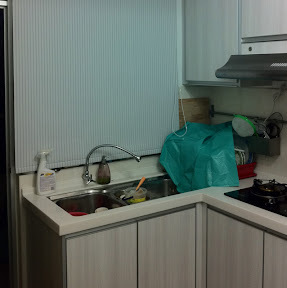 I was looking for a roller blind for our kitchen and the previous booth selling the such blinds was rather expensive (priced around RM400+). We were happy to find out that Maxtrack Curtains are selling theirs for a mere RM200, and they don't charge for measuring visit and installation although our house is quite far from their outlet. 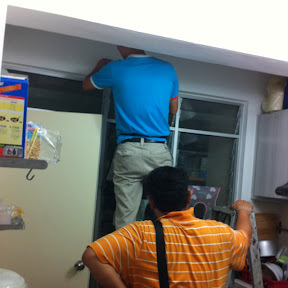 Their service is quite fast - within 2 days we received a call that they wanted to come over to measure our kitchen window (which took about 15mins only) and since it was a working day, they were quite happy to come over after office hours. I also got to choose the blind's pattern to suit my kitchen and I chose white and grey striped pattern that matched our kitchen cabinet. Maxtrack promised to deliver the blind after raya. The whole process took only 10 minutes and they did such a professional job that we didn't have to clean up after they did their drilling job (although we did cover our dishes with garbage plastic as a precaution). Overall we are quite happy with their service and affordable price. By the way, hope it's not too late to wish everyone Selamat Hari Raya, Maaf Zahir dan Batin!